Pyruvate Assay Kit | Cell Biolabs, Inc.
Pyruvate is an alpha-keto acid synthesized from glucose in the glycolytic pathway that serves as a key intermediate in several metabolic pathways. It can be converted to carbohydrates through the process of gluconeogenesis or to fatty acids through a reaction with acetyl-CoA. The process of fermentation converts pyruvate to ethanol or lactic acid. Pyruvate can also be used in the synthesis of amino acids and can provide energy to cells through the citric acid cycle. 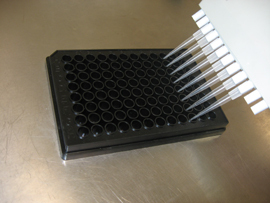 Our Pyruvate Assay Kit measures pyruvate in biological samples. First, pyruvate is oxidized by pyruvate oxidase, producing hydrogen peroxide. The hydrogen peroxide is then detected at ex. 530-570 nm/em. 590-600 nm using a specific fluorometric probe. Pyruvate levels in unknown samples are determined based on the provided pyruvate standard curve.